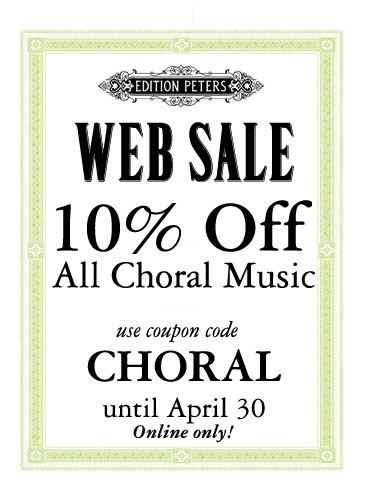 Good news for choir directors: this month only, Peters is offering 10% discount on all off our choral repertoire. Simply make a selection, click on the shopping cart and enter the coupon code CHORAL to see your discount. Press>Oxford University Press, Broude Brothers, Denington Choral Series, and Theatre of Voices--all publishers with truly outstanding choral catalogues. This spring, we're especially proud of the pieces you may have heard at this year's ACDA, including Robert Cohen's heartbreaking oratorio Alzheimer's Stories, Jēkabs Jančevskis's Atsalums (Coldness), and Toby Hession's She Walks in Beauty. But customers might also be interested in new releases from some of our best-selling choral composers. Ēriks Ešenvalds' Lux Aeterna is available in versions for high, low and mixed voices, and is joined in our distribution catalogue by his Where is Heaven? for mixed choir and his brand new, upper-voice setting, High Flight. Also for upper voices, Fredrik Sixten's Hymn of Hope and A Cradle Song demonstrate why the Swedish composer is rapidly gaining a foothold of his own in the American choral repertoire, while UK-based Marco Galvani's Stella Caeli for mixed voices marks him as a composer to watch. The renowned English choir Ex Cathedra has recently championed a pair of new works by Peters composers: Roxanna Panufnik's Celestial Bird is the title track on their new all-Panufnik album, while Alec Roth's Shared Ground is a longer work setting a text by Vikram Seth. We're taking 10% off all of these titles, plus our usual crop of Edition Peters' great new music and classic repertoire, from now until April 30.